Advenser offers full-service solutions for all your mechanical room modeling requirements. We specialize in providing BIM services to the construction industry for many years. 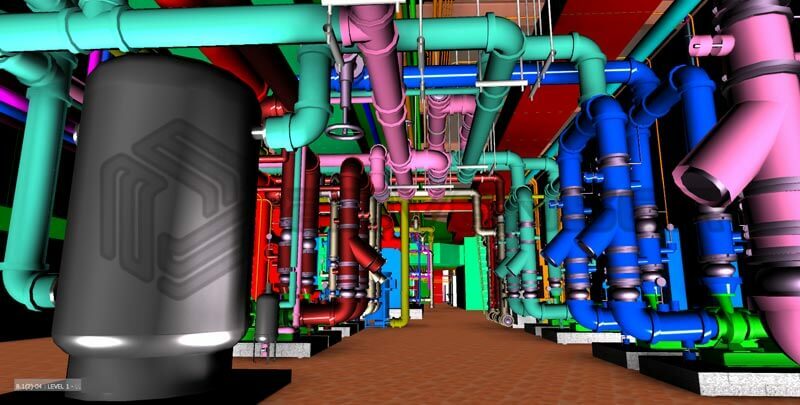 We provide mechanical modeling services to MEP/ HVAC consultants, fabricators and manufacturers for Commercial and industrial sectors around the globe. Mechanical rooms are complex spaces containing chillers, heat exchangers, Pressure Vessels, control valves, stand pipes, swing-bolt closure, sanitary, boilers and ducts. In our process, we analyze the entire system layout and drawings to provide the well-equipped model considering all the aspects of clashes, access spaces, future repairs etc. In addition to that, we may suggest modifications in the arrangement of equipment and ducts, their location and spacing to attain the desired results. We have a team of people who are well experienced in modeling of Mechanical rooms. We use the software Revit MEP, FABmep and AutoCAD MEP in mechanical modeling. Our reliable services aid contractors to bid profitably and to deliver quality service to customers. We ensure to maintain the industry guidelines and have substantive exposure to international codes pertaining to the US, Europe and Australia.